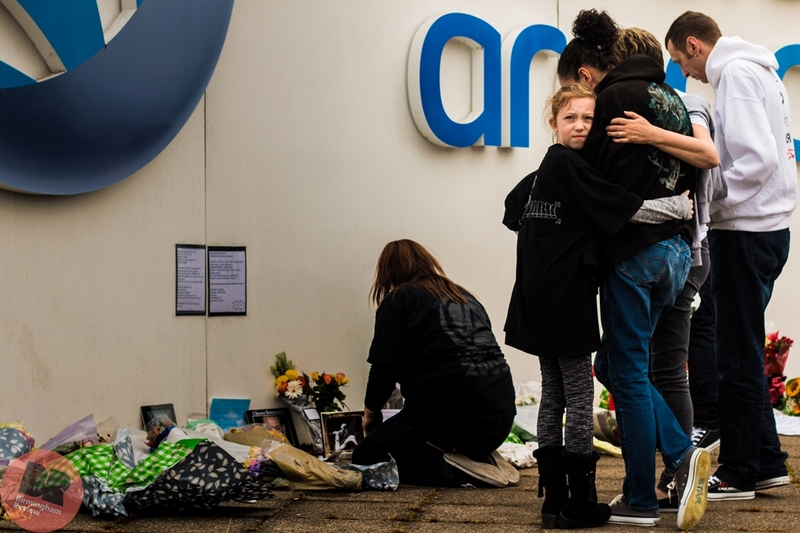 ED’S NOTE… Birmingham Review would like to thank Mark Shiel and Sarah Aggarwal for all their hard work and compassion that went into this memorial; we would also like to thank the NEC Group and Barclaycard Arena staff for hosting and supporting this event. 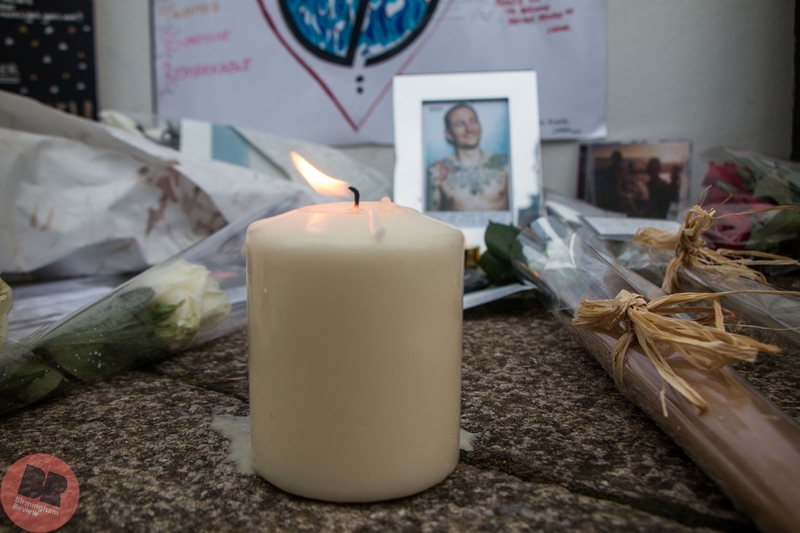 As Birmingham Review’s editor, I further would like to thank Eleanor Sutcliffe and everyone who talked to her at the One More Light memorial – allowing us to commemorate Chester Bennington in the words that matter most, those from his fans. Much love. I’ve never been to a stranger’s funeral. The death of Chester Bennington shook the music world to its core, and for good reason. Linkin Park were credited with bringing nu-metal to the masses following the release of Hybrid Theory in 2000 – an album that was nominated for three Grammy awards and sold over 24 million copies worldwide, making it one of the most successful debuts of the 21st century. ‘In The End’ was a song that stuck with me throughout my teenage years, and although I found other bands along the way I could always listen back to Linkin Park‘s material. They were a constant source of new music too; a foundation for me to build my love for rock and metal upon. 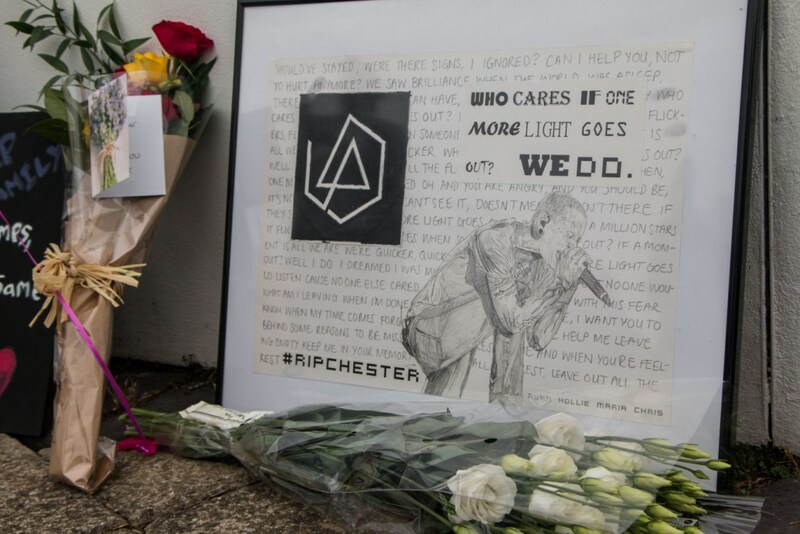 So when I heard that there would be a memorial service held in Birmingham in honour of the late singer-songwriter and Linkin Park front man, I felt compelled to attend. 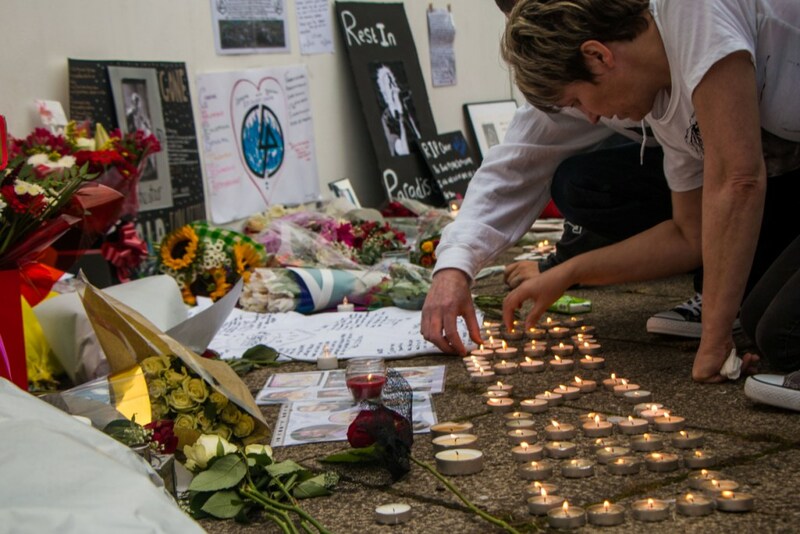 I’d been advised by the event organisers, Mark Shiel and Sarah Aggarwal, that New Street was the best place to meet before heading to the official memorial site – the Barclaycard Arena, the last venue that Linkin Park played prior to Chester Bennington’s death. Spotting them and their group was easy enough as almost every one of them was wearing some form of Linkin Park merchandise. I was shocked at the number of people; it was still early and many more fans were expected at the arena. Introducing myself to Mark and Sarah I was greeted with smiles, hugs, and thanked for coming. Watching them it was soon clear that I wouldn’t have a chance to pin them down for an interview as they were constantly checking in with fans and were inundated with phone calls from others that were soon arriving. Sarah announced that we would be leaving for the arena and, after mentioning I knew of the whereabouts, I was soon tasked with leading the group up. I was surprised that the organisers and fans were so trusting of me. Venue security met us outside the Barclaycard Arena and, after assuring us to take as much time as we needed, led us up the steps. Conversation began to fade and soon it was silent; individuals started to walk forward, flowers in tow, heads bowed and tears falling. The idea of speaking to fans at this moment felt wrong. However, by simply watching I saw enough. 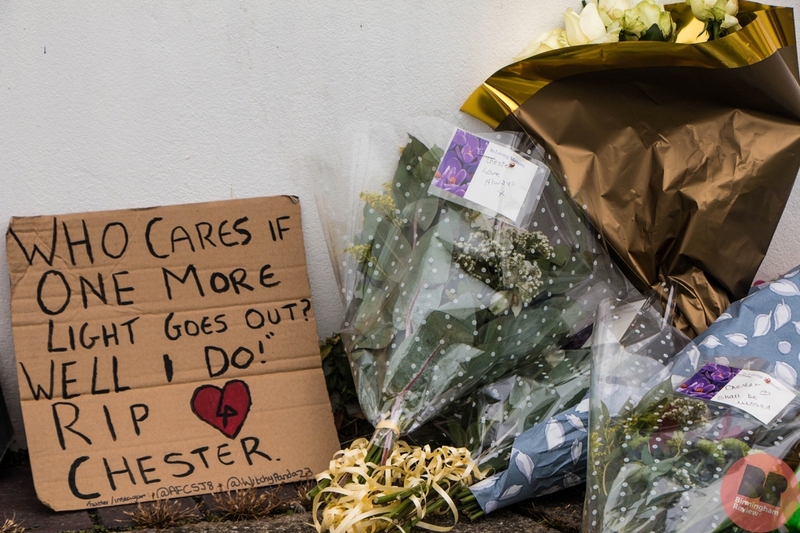 Some sat and cried alone, while others huddled in protective groups, holding hands and whispering condolences. Flowers, drawings and letters were all laid with care; notes, hastily scribbled onto pieces of card handed out by Sarah, were tucked under photo frames and into bouquets. After laying a bunch of white roses, I sat next to a woman and asked how long she’d been a fan for. She shook her head and laughed softly, telling me she’d been listening to Linkin Park since probably before I was born, “I can remember watching the video for ‘Papercut’ on TV, before YouTube even existed, and thinking what is this? Who is this? And I was hooked”. I asked how she felt the band had helped her personally, and she started to cry. “They were incredible. They could put into words how I was feeling before I even knew. They were always there for me to rely on, and for others to rely on too – an army of bands and musician stand on their shoulders. I just can’t understand how, when they were always there for us, how no one was there for him.” It was clear the other fans felt the same. 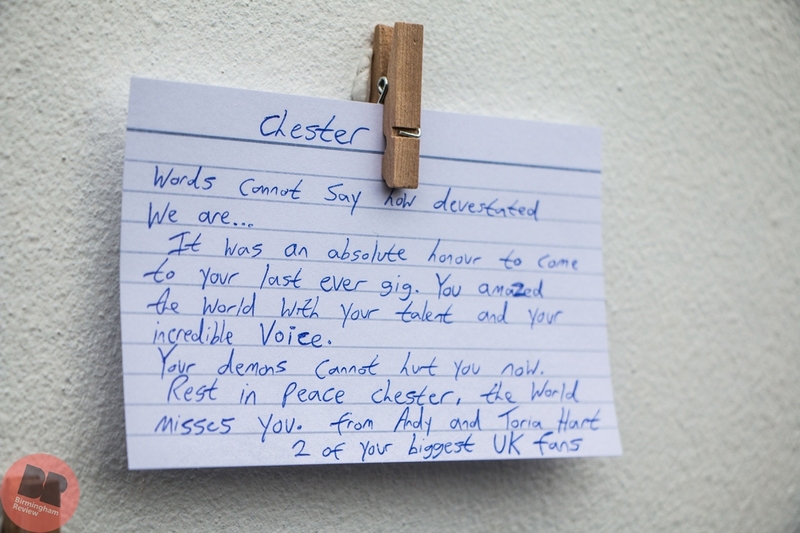 What shocked me was how personal this memorial was. 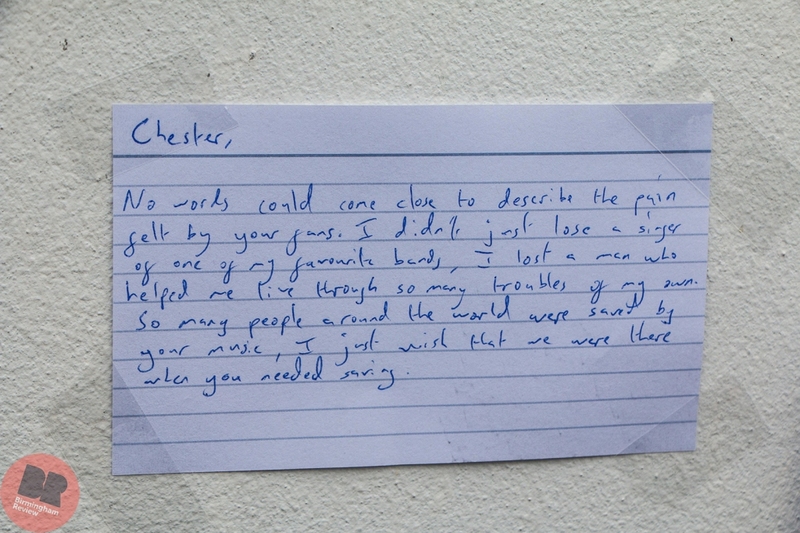 As I wandered between groups of people, I heard fans openly explaining how their lives had been influenced by the Linkin Park’s music. 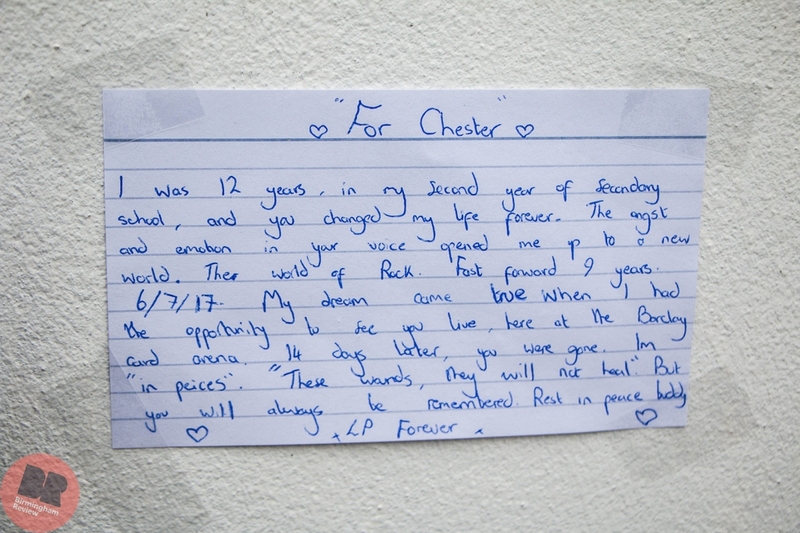 Many people did not want their photos taken, but only to write letters to the late Bennington or to sit quietly and simply listen to Linkin Park‘s music. However those that did share their thoughts and feelings with me did so at length. 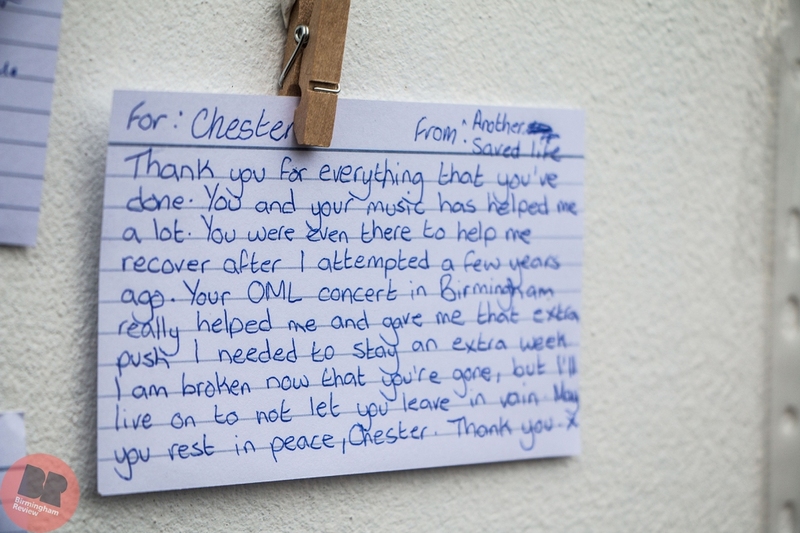 One man I spoke to explained how he felt that Linkin Park provided “a voice for the voiceless”, and even recognised them with saving his own life. Another credited their success as a musician, along with that of their friends, to the late Bennington. Fans spoke to me about their battles with depression, abuse, or the death of family members, and how discovering Linkin Park helped them confront their fears and learn to live again. 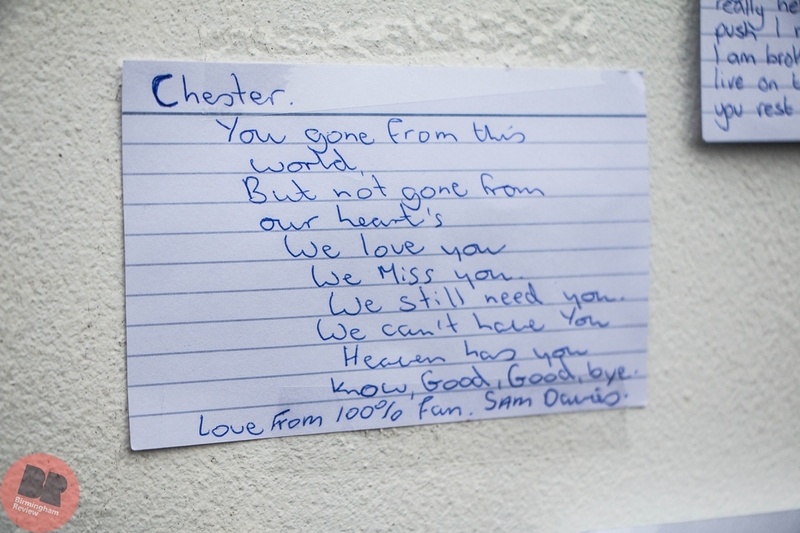 For many, Linkin Park’s music was more than melodies and riffs – it was a sanctuary, a safe place in which fans could lose themselves and heal. When I took on this job I did not expect to feel as emotional as other fans; I was there to report, to capture the event and then leave. However as time went on I found myself faltering. I never thought I would be so upset over someone whom I’d never met, and yet there I was hiding my tear-stained face behind my camera lens. Watching grown men and women cry as they lay flowers stirred up feelings of grief inside of me that I had not anticipated. Feeling rather overwhelmed I decided to set my camera down and gather my own thoughts. Sitting with one of the organisers, Sarah Aggarwal, I ask how she had a connection with the band. “I used to be on the Linkin Park street team, back in 2003” she explained, gesturing to her t-shirt. “I knew I didn’t have to do this, but I felt like I should. It feels good to finish what we started”. Suddenly a fan appeared, wanting to thank Sarah for all her hard work before they leave. Realising a queue of fans had now formed behind us, I step aside. Despite not speaking to Sarah for as long as I would have liked, I watched her work tirelessly throughout the day providing invaluable support for the fans present. I’ve never seen someone suppress their grief for so long to support others, and it was truly humbling to watch. 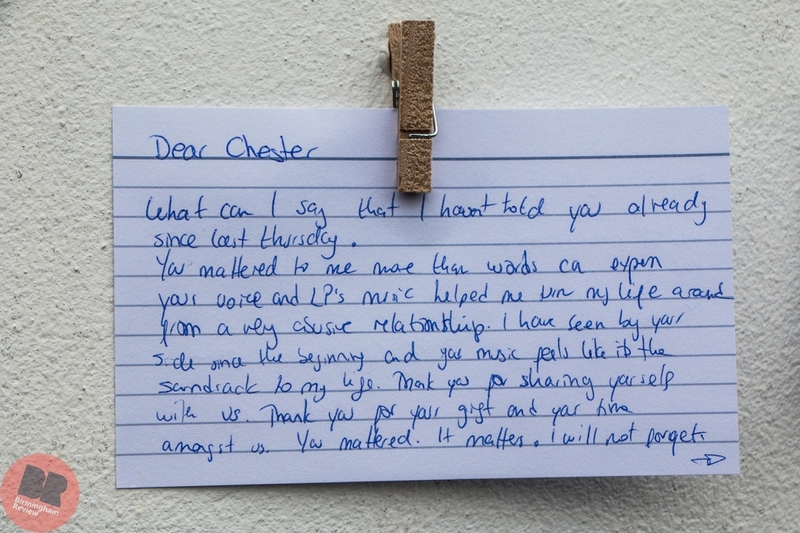 For many fans Linkin Park’s music served as an invaluable lifeline through some of the hardest points in their lives. They cannot understand how a man who helped so many felt so lost in the end. 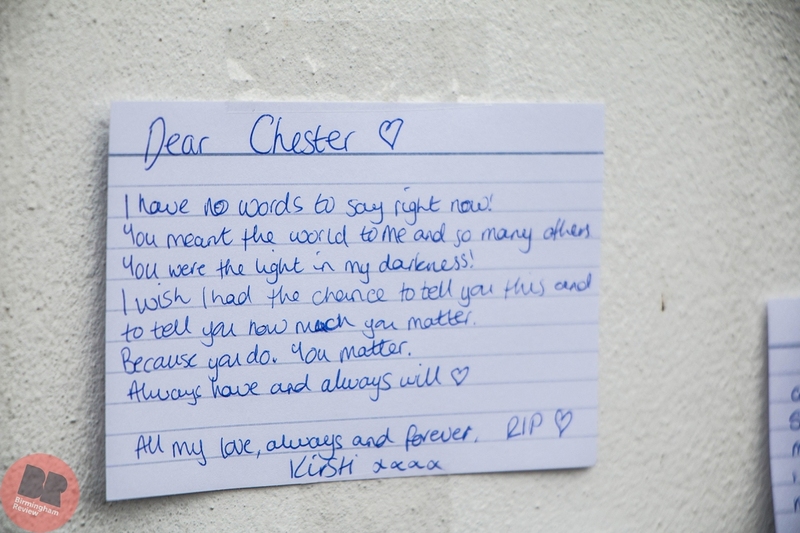 And although I never knew Chester Bennington, this memorial felt like the funeral of a close friend; I had deeply underestimated the personal connections these fans had forged with him, with Linkin Park, and with their music. This feeling was made even more poignant by the singing that would eventually take over the crowd, as fans held hands and sang along to the title track on what would turn out to be the band’s last album with Chester Bennington, One More Light.